MileagePlus Dining, the programme which awards you United Airlines miles for eating in certain US restaurants, isn’t of much interest to United members in the UK. However, for a limited period, you will receive 500 United MileagePlus miles just for signing up. If you have a United account, you might as well give it a go. The link is here and the offer runs until 30th March. You will need to temporarily change your account address to a US one first judging by the comments below. 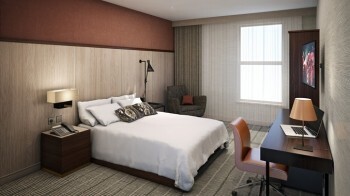 How new DoubleTree by Hilton hotels are springing up everywhere! I stayed in the Ramada London Docklands for the grand sum of £20 during a promotion a couple of years ago – I reviewed it here. The hotel was in need of refurbishment but it was an acceptable property with a decent pub just behind. It is now the DoubleTree by Hilton London Excel. Looking at the room photo above, it has seen some money spent on it. I imagine rates will be low when Excel is closed and, via the DLR, you can get into Central London quickly via the Jubilee Line at Canning Town. It is an absolute stinker of a Hilton HHonors redemption at off-peak dates. In February, for example, I found it at a shocking 50,000 points per night on a day when the cash rate was just £80! Avios 'last minute deals' are back for next weekend - where can you go? I did the £20 Ramada stay too, for two nights, and thought it was an absolute stinker even at that price. Unless you have something to do at Excel or immediate vicinity, this and tge other surroundi g hotels are best avoided at any cost. I hope no HFP reader finds themselves stuck out there due to the liberties the hotels take with their advertising. But …. £80 for a Tue in Feb, based on a sample day when Excel is quiet, is a great deal in London for a refurbed hotel on the DLR. James and Raffles, I guess you are right, if one’s relaxed about it then it could work. Personally, I felt like I was in the back of beyond and always disgruntled getting too or from DLR which felt like a bit of hike through the car parks and over the edge of Excel. I would rather stay in Wembley or Croydon. If no good rates there you can always book and cancel to generate the 20k points needed for HI Wembley for around £90. However, for HH diamond I concede DT Excel could be great deal at £80 midweek. I get this message… Your primary address does not appear to be in the 50 U.S. states (and DC). Please call 1-800-555-5116 to complete your enrollment. Seriously?? Like they imagine no British person ever travels to the United States? It’s very quaint the ideas some airlines get. Changed address to the US one and it got through. Then changed it back to the UK. Hope points will still be posted. So I’m stuck with an address set to a random NY hotel. Very bad idea since this is likely to trigger that you would have to fulfill their PQD requirements for earning status. I am travelling down to London on Monday ( free thanks to redspotted hanky) Staying at the Radisson Blu Edwardian Vanderbilt ( on the Carlson FF rate £57.59 which includes a £15 bar credit). I picked this hotel as it looks to be near the Royal Brompton where I am having some tests and a consultation with a specialist. A few questions for the London based HfP folk. Can I buy an Oyster card at Kings Cross Station when I arrive. OR would it be easier using taxi from KX to the hotel on Cromwell Road. Finally any recommendations for a nice bar serving food near the hotel. Easiest just to use a contactless credit card rather than oyster for occasional use, same journey price and oyster costs £5 deposit. You can buy an Oyster card at the ticket machines if you want. Thanks, didn’t know about the contactless credit card option, do I still buy a ticket or just swipe the CC at the barrier. But don’t forget to register online first. You can’t just turn up and use contactless to travel. Yes you can, I’ve turned up and used a credit card not linked to my online account many times! You can use a contactless credit card without registering it first but if there are problems with swiping or too much money has been taken, it’s easier if the card has been registered in advance. I work at Imperial College so I know the area fairly well. There’s a few pubs near your hotel. There is the Gloucester Arms on Gloucester Road or nearer still is the Stanhope Arms next to Tesco. My favourite pub in the area is the Queens Arms which is just off Queens Gate Mews. If late night refreshment is in order I’d go to Gentings Casino opposite the Natural History Museum – you can get membership on the door for free. The bar takes Amex too! I’m pretty sure you can just turn up and use contactless. Registering does allow you to review your journey history and print off the history and costs (useful for expense claims) though. I just checked and, my mistake, you can. Apols! Indeed, it’s a fantastic system! The only need for an Oyster card now seems to be if you need to load a travelcard on it – capping works fine. I wish other cities had a similar system. Opal in Sydney is free for the card but you have the hassle of reloading it (nowhere near as many places as Oyster) and being left with a small residual balance. There’s talk about trying to implement a TfL NFC system in a couple of years. Melbourne on the other hand has Myki, which was ludicrously overpriced and isn’t easily upgradeable to support credit cards! The number of points required for free nights at Hiltons has become fairly ridiculous and my experience is that the standards in European Hiltons is slipping. As a gold card holder I am starting to wonder if it really is worthwhile to have allegiance to any particular hotel group. Sometimes the upgrades are not granted, even when a call to central reservations shows that they are available. I’m now looking around.